2017June10 Birding at Eagle Point. 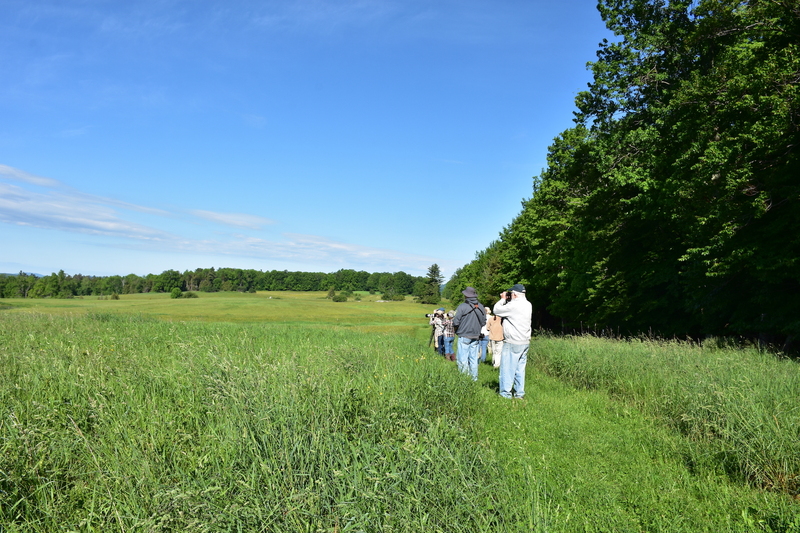 14 birders meet up for a morning wander around the Eagle Point (Derby, VT). The Friends of the Missisquoi National Wildlife Refuge and the Memphremagog Watershed Association (MWA) hosted the event. We are fortunate that the Friends of Missisquoi venture to the Northeast Kingdom and share birding. Thank you expert birders Ken Copenhaver and Julie Filiberti for leading us! For those who may not be aware – Eagle Point Wildlife Management Area is owned by the U.S. Fish & Wildlife Service (USFWS) and managed by the Vermont Department of Fish & Wildlife as a Wildlife Management Area. The USFWS acquired the property in accordance with the terms of the Michael Dunn Trust, which offered the land to the federal government as a donation.unit of the Missisquoi National Wildlife Refuge. The Eagle Point unit is a rich resource of habitat and allows for many recreational opportunities. Some 34 birds were heard and or seen during the morning walk of the mile and half loop. Of course along the way we frequently paused to appreciate or investigate other wonders of nature. It is always a treat to hear the musical sounds of the bobolinks but only saw a few flying about since most we busy at their nests. The grasslands are areas very much in demand because of habitat loss in the midwest. High over the wetlands, pair of osprey also were on their nest, perhaps feeding the chicks. We spotted one osprey returning to the nest with a catch. A variety of song birds and warblers delighted birder new and old. Working together we helped each other with observations as well as picking out some calls and songs. Entering the cool, shady forest was like opening another door. I have to admit the highlight was observing a Ruby-throated Hummingbird repeatedly returning to it’s tiny nest up in the canopy. Through the spotting scope, noticed it carried a bug. It’s fun to watch them at feeder but you may also see them pluck tiny insets from the air or spider webs. Enjoy them while they’re around. From what I have read, pairs are together just long enough for courtship and mating. Then the male is off and may begin migration as early as August. The others tend to head out in early fall – bound for Central America. DEC Advisory: Temporary closure of Scott’s Cove. The Vermont Lakes & Ponds Program plans to once again implement a temporary closure of Scott’s Cove. The closure will begin May 26, 2017 and continue for 90 days. Starry stonewort, an invasive species, was discovered in the Cove during summer 2015. The closure is intended to decrease the chance of unintentional spread out of the Cove while Lakes & Ponds Program staff members assess management recommendations. This year, the closure will only prohibit passage of vessels through the channel between the Cove and the larger Lake Memphremagog. Boaters will be able to use the Cove as long as they access it from Prouty Beach or a private launch. To alert citizens of the closure, we will post signs attached to stakes or buoys at the entrance to Scott’s Cove in front of the beaver dam and behind the beaver dam. Montpelier, Vt. – The Vermont Department of Environmental Conservation is seeking public input on three draft plans being released today to strategically improve water quality in the Lake Memphremagog watershed. A series of public meetings will be held this month to discuss the plans and hear suggestions from citizens. The waters of Lake Memphremagog are shared with the province of Quebec, but most of the ponds and rivers that feed it are located in Vermont. The watershed includes the Black, Barton and Clyde Rivers, and many lakes and ponds such as Great and Little Hosmer Lakes, Lake Parker, Crystal Lake, Lake Willoughby, Island Pond, Great and Little Averill Ponds, Norton Pond, Holland Pond and Seymour Lake. To keep these waters in a healthy condition, the State is required to write a pollution control plan known as a Total Maximum Daily Load (TMDL) to set limits on phosphorous pollution being contributed to the lake. The draft TMDL for Lake Memphremagog released today sets a target of 29% reduction in phosphorous flowing off the landscape into the lake. To meet that target, the Department of Environmental Conservation worked with local and regional experts to draft a Tactical Basin Plan, which outlines watershed-specific actions and projects necessary to achieve the target. A specific part of the TMDL requiring public input is the set of proposed pollution limits for wastewater treatment facilities in the Lake Memphremagog watershed, known as “wasteload allocations.” The wasteload allocation is intended to fairly and equitably apportion allowable levels of phosphorus pollution among wastewater treatment plants in as cost-effective a manner as practical. 7:00pm at Brighton Town Hall, 49 Mill Street Ext. Public comments on the plans will be accepted until close of business on June 16, 2017. To view a copy of draft TMDL and tactical basin plan, go to http://dec.vermont.gov/watershed/map/basin-planning/basin17, or request a copy from Ben Copans at ben.copans@vermont.gov or (802) 751-2610.
the Vermont Invasive Patrollers (VIP) Program. VIP workshops cover such fundamentals as the difference between native, exotic, nuisance and invasive species; how invasive species are introduced and established; how to differentiate native aquatic plants and animals from their invasive lookalikes (plants will be emphasized); and how to conduct surveys for aquatic invasive species in lakes and ponds. Register Online! The Newport VIP training will be a joint workshop with the Public Access Greeter Program. The Greeter Training starts at 10 AM and the VIP training starts at 12:30 PM. You are welcome to attend both. The Newport Parks & Recreation Department is looking for people to fill the job of Greeter at the Newport City Dock. In an effort to educate the public on aquatic invasive species and to improve the recreational value and overall health of Lake Memphremagog, the department wishes to implement a Greeter Program. Click the following link for more information. Greeter job description. March 29, 2017, 9:00 a.m. – 1:00 p.m.
We are encouraging people to come to the Vermont Statehouse and show their support for investing in clean water now, so please share this with your members!